The 53’ carbon-fibre “Bank von Bremen” is owned by German sailing club Segelkameradschaft “Das Wappen von Bremen” e.V” (SKWB), “The Brotherhood of Bremen”. Skippered by Rainer Persch, with a crew of nine German sailors of all ages, the boat has previously taken part in the Rolex Middle Sea Race, the Round Iceland Race and many other international events. “Bank von Bremen” is the latest boat commissioned by the club which was founded in 1934. We are very pleased to welcome our German friends to Ireland and hope they enjoy their stay in Galway. Dinah. Barry Hurley. Andrieu - JOD 35’. IRC 1.011. Single-handed. Barry Hurley (IRL) is sailing his JOD 35 “Dinah”, the boat on which he won his class in the 2009 OSTAR (Single-handed transatlantic). This was a huge achievement for an Irish sailor. 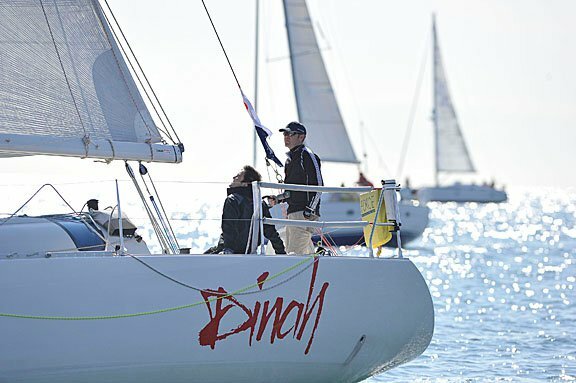 “Dinah” went on to win the two-handed class in the 2011 Dun Laoghaire – Dingle race, Andy Boyle on board with Barry. Barry Hurley has done a lot to raise the profile of Irish short-handed sailing and we are delighted to have him in the race. Killary Flyer. Jamie Young. Freres - IOR 50’. IRC 1.094. Single-handed. Without Jamie Young (IRL) there would be no Round Rockall Race. Jamie took part in the 1976 OSTAR on John Ridgway’s “English Rose IV” and went to Rockall as part of his qualifying passage. In 2005 he brought Rockall Race organiser Larry Hynes to Rockall and the seed was sown for the race. Jamie and his wife Mary completed a two-handed transatlantic for their honeymoon on Mike Richey’s legendary 25’ junk-rigged folkboat“Jester”, formerly Blondie Hasler’s boat and his entry in the 1st OSTAR, the race that Hasler conceived. For the Round Rockall Race Jamie is sailing his 50’ Freres-designed “Killary Flyer”, former Admiral’s cup yacht “Noryema”.